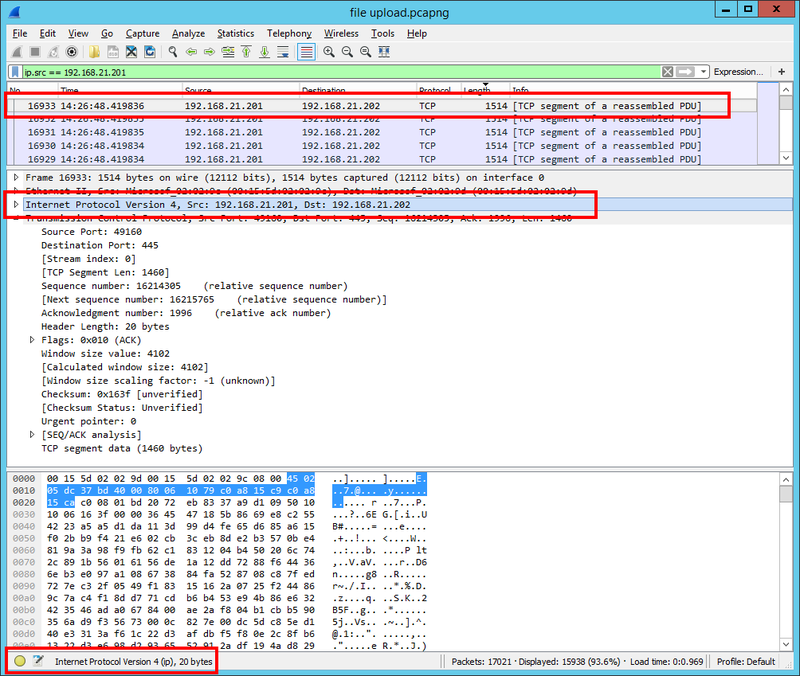 Because the file share is a bit more complex, I will explain in advance what you will see in the next Wireshark and Process Monitor screenshots. In a non-academic explanation: when a file is copied over the network, the file is read from the disk in 1 MB chunks. Each 1 MB chunk is then sent through the network. At this point SMB is the communication protocol. 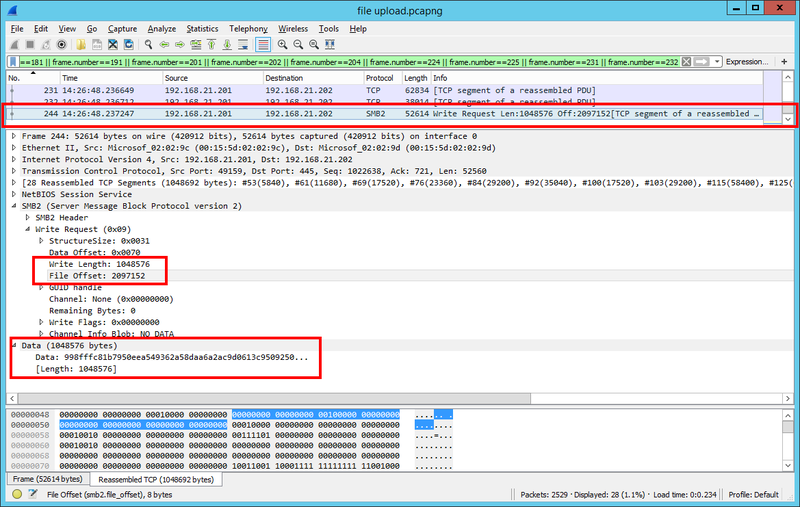 SMB divides each 1 MB chunks in smaller chunks (up to 64 KB each) and is requesting the network adapter to send them to the destination. Continuing the file share explanation: actually those SMB smaller chunks (up to 64 KB each) are sent over the network in much smaller size packets. The size of those packets is in direct relation with the Maximum Transmission Unit size. Let’s pause again the explanation and mention in the absence of Large Segment Offload (LSO) (TSO / TCP Chimney Offload) the 1 MB chunks will be directly divided to packets in size with the Maximum Transmission Unit. On the other “end of the wire”, the system where the file is written to, will receive network packets who will not exceed the Maximum Transmission Unit size. The purpose of this explanation is to help reproduce as close as possible the file share network traffic using IOmeter. This is the Process Monitor capture performed on OPIOA3_01 VM while an EXE file (en_.net_framework_4_full_x86_x64_508940.exe) was copied via network (file share). In the picture the top-red rectangle indicates the fact the OS is reading the file from disk in 1 MB chunks. 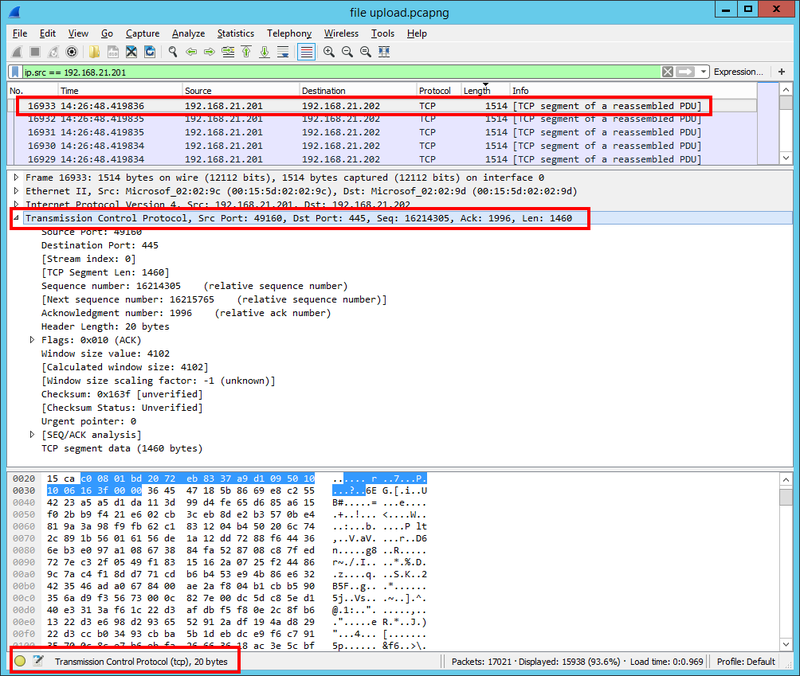 The middle-red rectangle indicates the WriteFile operation that will be analyzed in the next pictures (Wireshark screens). The bottom-red rectangle indicates the TCP Send & TCP Receive operations performed by the System as result of the WriteFile (via network) commands. 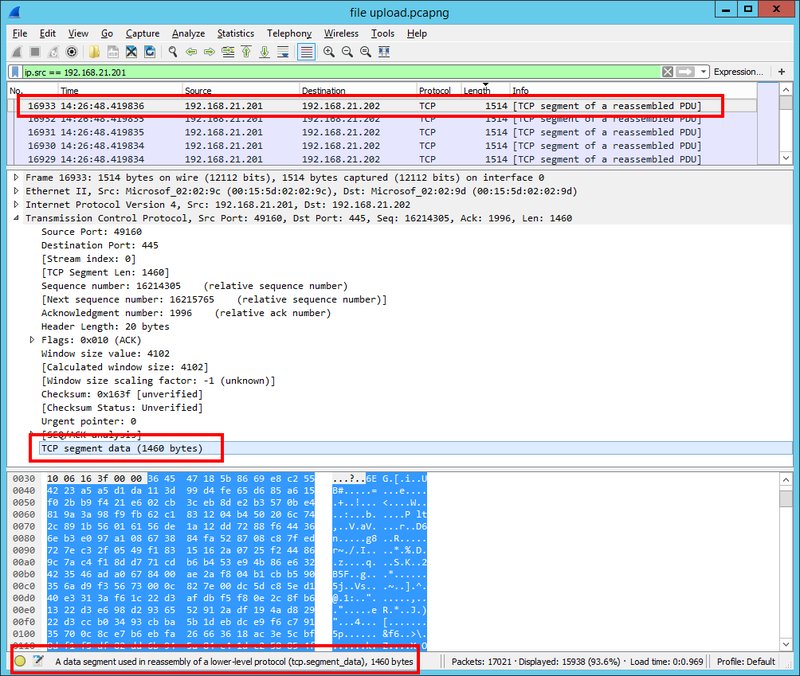 The WriteFile Event Properties -> this is the Process Monitor event who will be tracked later in the Wireshark screens. Here we have the Wireshark capture (performed on OPIOA3_01 VM) filtered to show what exactly does “WriteFile Offset: 2,097,152, Length: 1,048,576” operation means in terms of network traffic. Please note the 1,048,576 bytes (the 1 MB data chunk from the file sent over the network) are actually split in multiple (28) packets (no larger than 64 KB each). 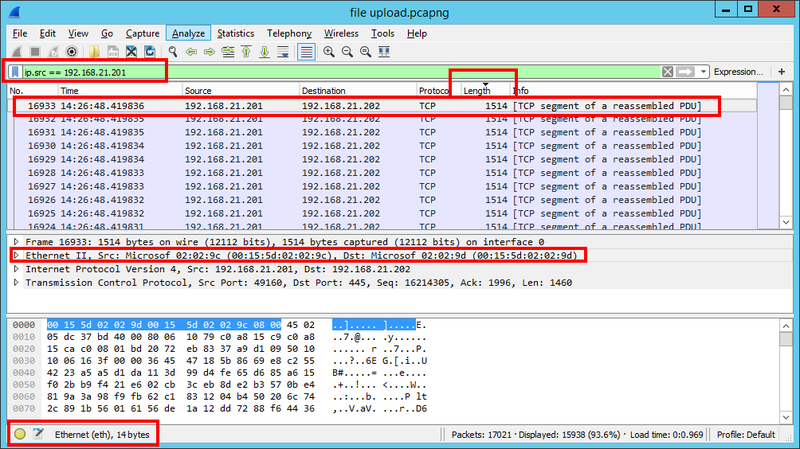 Here we have the same Wireshark capture (performed on OPIOA3_01 VM). Note the fact Wireshark reassembled all those 28 packets. We can see the Write Length, File Offset and the amount of data match the numbers from Process Monitor (Write Length=1048576, File Offset=2097152, Data Length=1048576 bytes). BUT, the Wireshark capture performed on OPIOA3_02 VM (the system where the file was written to) indicates that maximum size of the received packets from OPIOA3_01 is not exceeding the default Ethernet MTU (1500 bytes). 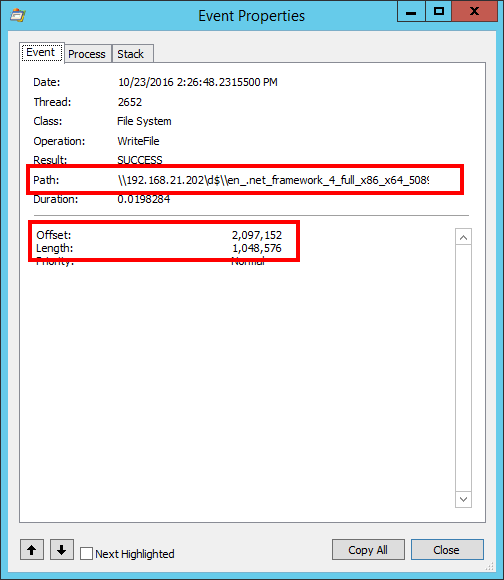 when a file copy over the network is performed, initially the file is read from the disk in 1 MB chunks. 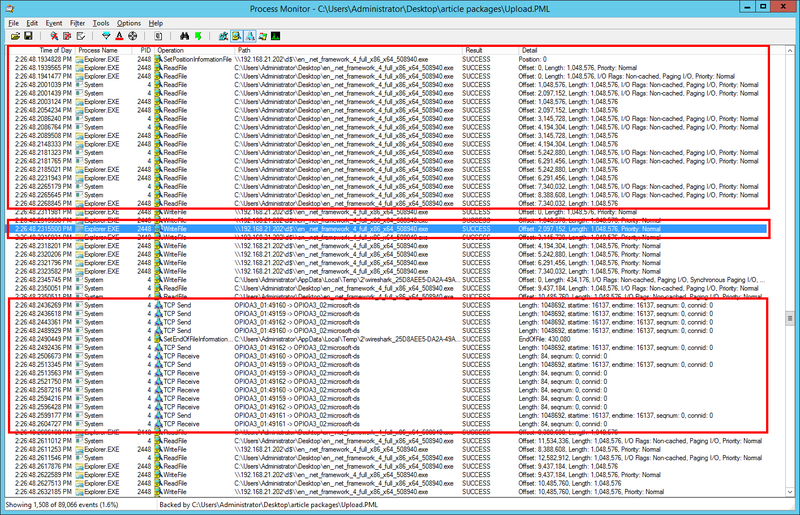 each of those 1 MB chunks are requested to be written to a remote network resource. at the application layer the SMB protocol is used for handling the data transfer between the systems. SMB divides each 1 MB chunks in smaller chunks (up to 64 KB each) and request the network adapter to send them to the destination. the 64 KB chunks are actually sent over the network in much smaller size packets (the size of those packets is influenced by the MTU size). Again, this explanation will help reproduce as close as possible the file share network traffic using IOmeter.